The result was that they went back to the Insurance company and asked for an asbestos survey. The testing company arrived today and planned to be all day doing a “full invasive survey” – which means taking small samples of everything = woodwork, floor tiles, curtains, plaster on the walls, everything in the auditorium, backstage, in the toilets and foyer. I did not like this and said so. After all this was for someone to clean the theatre, not pull it down. After a number of phone calls between the two companies, and myself with the insurance, we finally settled on a non-invasive inspection which was largely visual with an element of presumption, For example that wood panelling looks like wood therefore I can assume that it is wood and isn’t concealing an underlayer of asbestos. I agreed that they could take a sample of the suspect tiles. This involved the guy donning full protective gear and sealing off the room while he removed a small sample and tested it. Meanwhile I had another visitor, a French Polishing Company from Stafford. They had been sent to give an estimate for cleaning the seats. This chap was very informative, but gave me the distinct impression that my hopes for an October half term reopening were pretty unlikely. 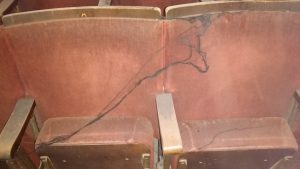 I have no fear of spiders, but I do constantly battle with them since they do like decorating my theatre with their webs. I try to remove the visible ones in corners, on chandaliers etc. And before each season I have to get a brush on a very long pole to try and dislodge webs on the very high ceiling. Actually these are so high, and as the webs are flush with the ceiling, they are virtually invisible. A fire alters all that! The smoke deposits layers of carbon on the web changing the gossamer thin strands to quite thick strings which sag with the weight and cling together, then fall as shiny black oily hanks. Quite wondrous, but very smelly and dirty. Anyone who has suffered a fire will know one of the worst results is the long-lingering smell. The only place I can work in at the theatre at the moment is the foyer, and even here the smell is pretty acrid, although after half an hour or so one doesn’t notice it quite so much. I’ve been away for the weekend in Wolverhampton performing Punch & Judy so my return on Sunday night was greeted by a temporarilly forgotten pungency. Last week was particularly busy with Punch work since it was the week of the two biggest Agricultural Shows in North Wales, The Denbigh and Flints Show and The Anglesey Show. Both are events I always enjoy, although I don’t enjoy the very early morning starts. At these big events one needs to travel to arrive in the early morning since you have to be fitted up and vehicle your off the site by 8 am. I usually set my alarm for 4 am on show mornings. Things are still progressing depressingly slowly. Unfortunately the fire clean up and restoration has to be professionally done (well the insurers are paying) but that means I am at the mercy of already busy tradesmen who have other calls on their time and haven’t just been sitting around waiting for me to suffer a fire. Things would be very different if it was something where I could call on well wishers and volunteers. I am so grateful to have had an abundance of offers of help both from fellow puppeteers but also from audience members, parents and grandparents who bring their children to the shows. I do thank you all for your kindness, but really there isn’t much anyone can do at this stage. Posted on 21st August 2017 Leave a comment on Back to the Smells. Still very little progress, still awaiting estimates. Electrical and joinery contractors have done their surveys, but not yet put anything on paper. The cleaning contractors are deciding whether to clean the seating in situ, or take it all away. If they decide the latter it will be up to me to find a firm to unbolt the seats for transporting, then re-install them when cleaned. Meanwhile everythiing is held up while I await an asbestos survey. If any is discovered then all sorts of delays can be anticipated. The electrician told me of a job he did recently where the local authority had to be given two weeks notice before asbestos removal commenced. The opening for the October half term seems slightly in question! Luckily I have been extremely busy with Punch & Judy shows this last week (three agricultural shows and a museum) so I have no time to brood. Hope the Summer is going well for all you reading this. We’ve had some terrific weather in North Wales. Thursday was perfect. Brilliant sunshine all day with a slightly cooling breeze in the afternoon. 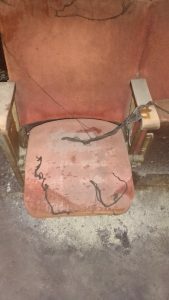 In the early hours of August 2nd 2017 the theatre suffered an arson attack. 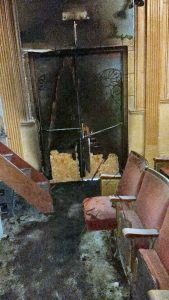 The fire doors were destroyed and the auditorium damaged by fire and smoke, as was backstage and to some extent the foyer. One of the foyer plate glass windows was also smashed. The worst was the smell, and there were greasy soot deposits everywhere. These were so thick that cobwebs, gossamer thin, appeared like skeins of embroidery thread. It is now nine days since the fire and all that has been achieved is a visit from the insurance company’s loss adjuster and one from a specialist fire-damage cleaning and restoration company. Estimates will be needed from electricians and joiners and things are moving forward at a snail’s pace. I have no prospects of re-opening the theatre before the October Half Term. I have started this blog with the intention off keeping in touch and letting everyone know what is going on. Thank you for all the messages of support and offers of help via telephone and email. They are all so much appreciated. Format ImagePosted on 11th August 2017 8th September 2017 12 Comments on Fire! Fire!